This month OCWA will complete its latest capital project–replacement of the Academy Hill Pump Station in Manlius–using entirely in-house staff, resulting in an estimated savings of 25% of the project cost. Work on the project started on April 16th 2018, and consists of a complete mechanical rehabilitation of the pumping station. The overall building footprint is remaining unchanged. The equipment being replaced is aged, undersized, and configured in an inefficient manner. Inside the piping, valves, and pumps are being replaced with new, larger and better arranged components. The new pumps are capable of moving over 400 gallons per minute into the Academy Hill system and recently constructed Eagleview water storage tank. They will do so at greater efficiency than the previous pumps and at slightly higher pressure. This will allow OCWA to utilize the full capacity of the Eagleview tank and improve the normal operating pressure slightly for residents at the upper elevations of the service area. During the work, water is being pumped using an engine driven bypass pumping system that is located adjacent to the existing building. 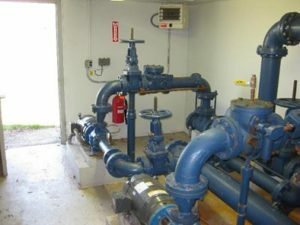 This self-contained pumping system is operating just like the pumping station and is connected into OCWA’s remote control system for monitoring and control. The pump was specially designed for residential areas and makes very little noise when running. 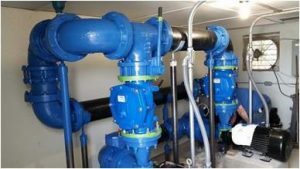 The evaluation, design, specification, procurement, and construction of the pump station improvements are all being performed in-house by OCWA staff. This will result in a substantial cost savings compared to traditional project delivery methods. OCWA anticipates completing the project in the next week and removing the temporary pump and restoring the site by the end of May.